Through the support and encouragement of Lago de Atitlan residents, in May of 2009 Selaine d’Ambrosi founded Ayuda, a small non-profit effort dedicated to needy dogs and cats in Guatemala. Selaine and her husband Harold, along with their two adopted dogs Bruno and Kizzy, moved to Guatemala in the winter of 2006. Earlier that year the couple had made an exploration visit to the area. They had been considering several places in the world to make their retirement home. But the lakeside village of Panajachel was quickly chosen when they experienced its extraordinary population of homeless dogs and cats. Shortly after they had made their move and gotten settled, their pack of adopted dogs quickly grew. Previously, and in addition to many years of working with various non-profit organizations, Selaine had also been part of a large animal sanctuary in the US Southwest. Her lifelong love of animals only grew more as she became active in the most modern practices of animal welfare. In choosing Guatemala as a new home, Selaine committed herself to bringing all she could to its needy animals. As if by fate, and after living in their rented Panajachel guest house for a very short time, a local nonprofit group asked Selaine and Harold if they would be willing to lodge a team of visiting US veterinarians. The couple eagerly stepped up to the lodging opportunity, as well as solved a second problem for the visiting professionals—where to hold their planned clinics. Using her formal medical training, Selaine configured their home for all treatment and surgical requirements well before the team arrived. After the completion of their four week mission through Central America, the visiting seven member team of veterinarians formally reported a #1 rating for the two day clinic in Panajachel. Greatly encouraged by the effectiveness of the clinic and wanting to do more, Selaine became actively involved with the non-profit group which had hosted the event. She became recognized as their founder of a new program focused on the health of pets and homeless animals. Between March 2007 and September 2008 many hundreds of animals in the Lake Atitlan region were sterilized, vaccinated, and received other forms of health care. Between the fall of 2008 and the spring of 2009, Selaine went back to hands-on basics. Always with her backpack filled with dog food and treatments for worms and fleas, she once again became a familiar face on Panajachel’s streets, indigenous neighborhoods, and mercado. As she encountered special cases of extreme medical needs, Selaine arranged for treatments by professional veterinarians as best as she could. Suddenly, locals began stepping forward and supporting her work through unsolicited donations. Others acknowledged how much she and her work had been missed and encouraged her to do more. She decided it was time to start a formal non-profit group focused on the well-being of homeless cats and dogs. 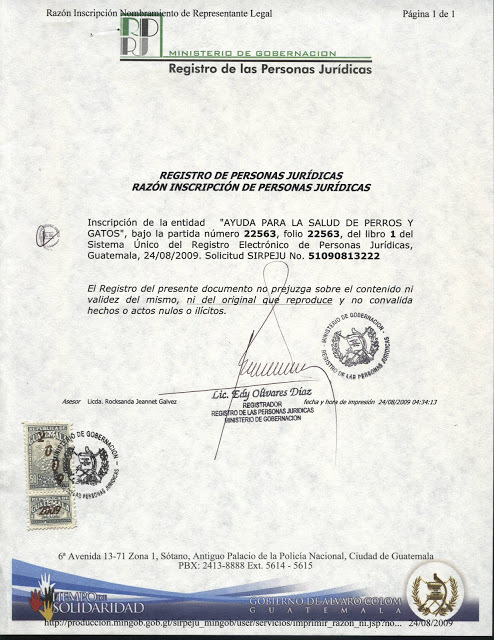 Ayuda became an official Guatemalan non-profit association on 24-August-2009. Click here to see a copy of the official mondato.